The RT-AC5300 looks absolutely ridiculous, the design is very sophisticated and pleasing. The 8 antennas are huge, unlike your usual antenna. Asus gave it some red accent to complete the “gaming” looks. The top features a maze-liked pattern with tiny ventilation hole cleverly hidden under the design. However, Asus continue their fashion of including only 1 LED activity indicator for all 4 LAN ports. 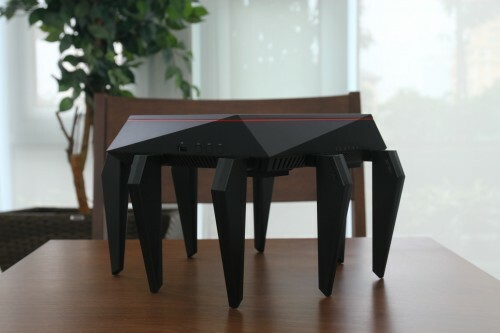 I guess it is a norm for new Asus routers now. 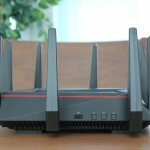 That said, the RT-AC5300 is no doubt a huge router. It is a 25cm square box and weighs around 2kg. As for USB port, the RT-AC5300 come with 2 USB ports, one of them is USB3.0 capable. As usual, the white LED indicator on the RT-AC5300 can be turn off for a more discrete look. There is a wireless toggle button as well. The RT-AC5300 comes with the familiar user-friendly ASUSWRT interface. It comes with some new features tailored for this particular router. I am a fan of ASUSWRT as it works really well with Malaysian ISP particularly Unifi. It is really stable and the included features are user-friendly. 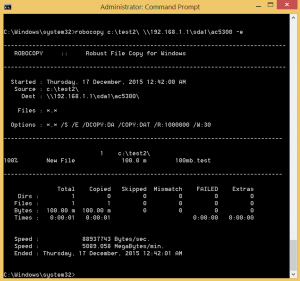 Adaptive QoS is something I use a lot. The QoS engine is able to intelligently prioritize the packet I want. It also intelligently allocates bandwidth between various clients to prevent traffic hogging. Asus RT-AC5300 comes with some gaming related optimizations as well. 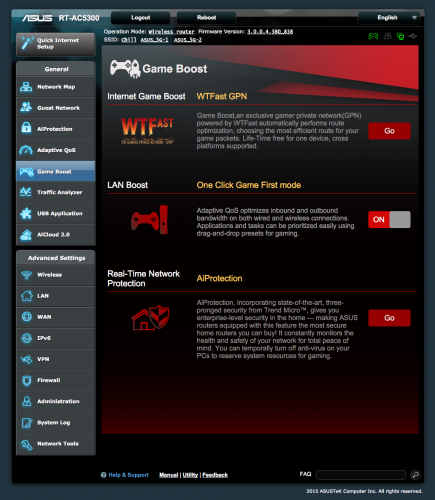 The game boost feature will activate Adaptive QoS and configure a gaming profile to prioritize gaming. The RT-AC5300 comes with a lifetime license of WTFast GPN. It is sort of a VPN to improve your gaming performance by providing a better route to the server. However, this feature is still in beta so it may not work with certain games. I found the game boost feature to be quite effective. My gaming latency does not seem to be affected even my another computer is downloading some files. 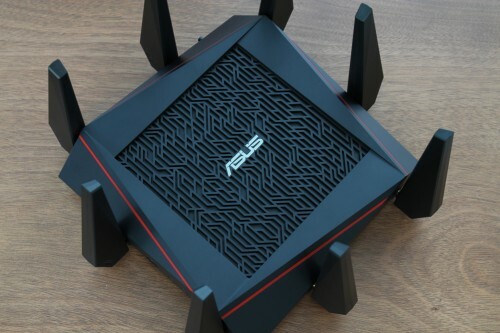 The recently announced Asus Router app works on this router as well. 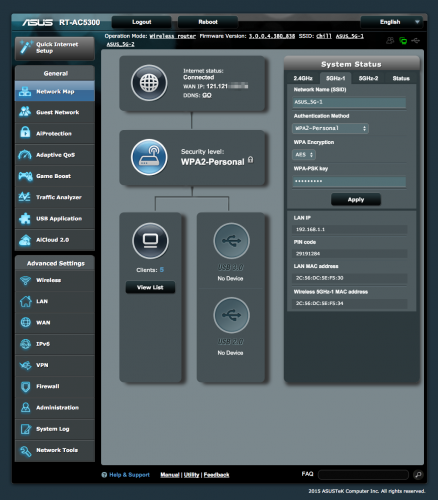 You are able to configure your router quickly via your mobile devices in an even simpler interface. 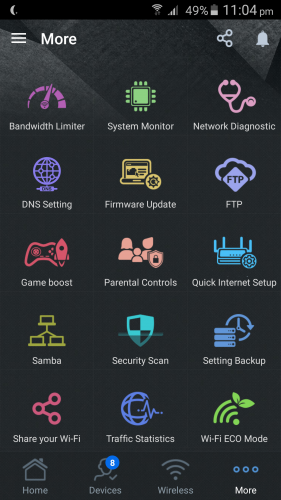 You can monitor your connection and configure the QoS quickly. In addition, rogue clients can be blocked easily via the app. Your client will be notified the connection is blocked in a polite way. There are a lot of things can be done and you can configure it remotely as well! Something new from Asus. 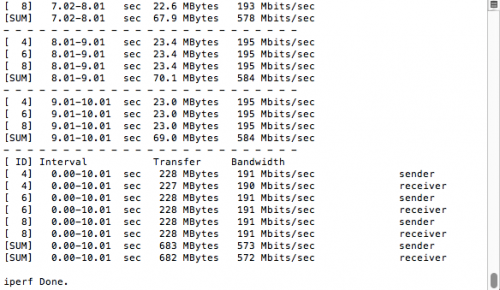 Another feature worth mentioning is link aggregation. This feature allows your NAS which support dual LAN link aggregation to obtain an even better performance. I cannot test this feature as my NAS do not support dual LAN. It is a useful feature for power users. 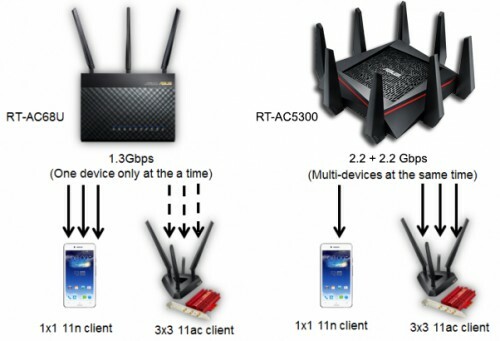 The RT-AC5300 support next generation 1024-QAM wireless and MU-MIMO. In layman terms, MU-MIMO allows the router to have more clients connected at the same time with a smaller penalty to the performance. 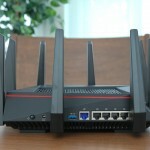 The router is able to achieve speed up to 2167Mbps on a single 5Ghz band. Thus, with the tri-band configuration, the router support a maximum throughput of 5334Mbps (2167+2167+1000). Speaking of tri-band, the tri-band Smart Connect from the RT-AC3200 is there. The implementation is similar to the RT-AC3200. It is still very complicated and I recommend users should leave it as it is. I am using my Macbook Air as the test hardware. 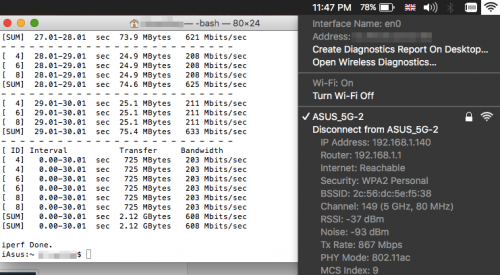 My Macbook Air supports Wireless AC up to 867Mbps on the 5Ghz band. On a 5m line of sight test, I am able to achieve a really good 608Mbit/s. It is by far the fastest speed I ever achieved on this test configuration. However, do note that my laptop is the limiting factor here. 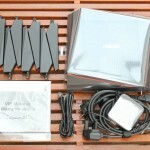 Asus RT-AC5300 support way faster wireless and I should be able to obtain a higher speed with a better hardware. I performed the test one step further by connecting another device to the same wireless connection. The test is repeated and I see some small decrease in performance. This is expected when there are more devices on the wireless network. However, the decrease is small and the performance is still a very respectable 572Mbit/s. It looks like a spider when folder this way! However, there is no consumer hardware able to utilize the wireless ability of the RT-AC5300 currently. Most wireless devices on the market only support up to 867Mbps currently. You may not be able to make full use of the offered ability now, but it is definitely a future proof device. The future of wireless technology is bright and I certainly look forward to more devices capable of faster wireless. Hi! I am using Unifi 30mbps plan at my house. 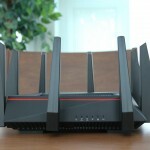 I am planning to get this router for a better range (not to brag, but my house is quite big). I tried AC3200 from D link but the connection is not that fast, and I couldn’t connect it to my HyppTV. Is this ASUS AC5300 compatible with HyppTV? Yes, all Asus routers are compatible with Unifi HyppTV. Check out our guide for that. Hi, I would like to ask in term of coverage, RT-ac5300 and ac88u which one is nicer? All Asus routers work with Unifi. I just got my unifi 30 mb package & it came with the dlink dir-850L router. The system is setup in a 2 storey house with the router place downstairs & my pc unit upstairs. Though the signal strength is 4-5 bars, the speed is not stable & I get normally 72 mbps or less. The unifi test speed is normally less than 10 mbps with upload around 1-2 mbps. 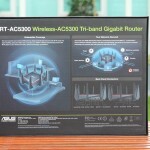 I am very keen to upgrade the router to the Asus RT-AC5300 but not sure if it is worth for my case. I am into online gaming (WOW). Get the RT-AC88U. They are pretty much the same buy you probably do not need the tri band feature. Can you give me advice on how to set up 2 different access point for my home. Meaning 2 wireless router is connected to the TM ONU. 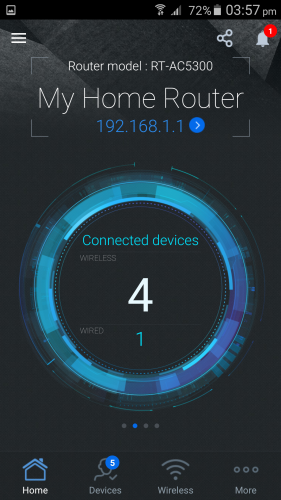 The reason for having 2 router is so that 1 wireless router can be configured to have VPN to get foreign IP, and the latter to use Malaysian IP. There’s no easy have 2 routers connected to the ONU under the same Unifi account unfortunately. The second router must be connected to the main router and configure your VPN client on your second router. Yes, it is available in Malaysia now. Asus still do not have a solution for Astro IPTV. hi there, just wanted to know is this router compatible with Unifi and the setup is as straightforward as the guide you provided? Yes, this router is fully compatible with Unifi and very easy to configure. Purchased it online from Australia but delivery to Malaysia declined as their 5 units got stuck at custom n must get approved letter from telekom, so asked to post it to neighbouring country and got no problems whatsoever. 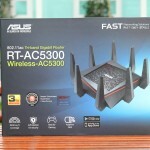 Can you tell me a comparison between this router and the asus rt-ac88u? The RT-AC5300 comes with faster tri-band wireless but the RT-AC88U comes with 8 LAN ports. 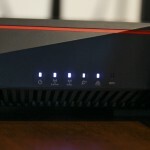 The RT-AC5300 is the better router for sure.